Yesterday is the first day of the Bon Festival. I visited the family grave on the site of a temple, cleaned it, offered flowers and burned incense. The temple were filled with people visiting their graves. Most families usually make offerings of flowers, burn incense and pray for the repose of their ancestors at Buddhist altars called butsudan(仏壇). It is a wooden cabinet with doors that enclose and protect religious icon, typically a statue or painting of a Buddha or the founder of a religious sect. We also enclose tablets with our ancestors' posthumous Buddhist name in it. During the festival, the cabinet's doors are opened and we place a special altar called shouryou-dana(精霊棚) in front of the cabinet. We lay a mat made of Manchurian wild rice leaves on the alter, set green bamboos on end at the four corners of it, extend a rope from bamboo to bamboo to mark the boundary between sanctified area and other areas and hang Chinese lantern plants on the rope. 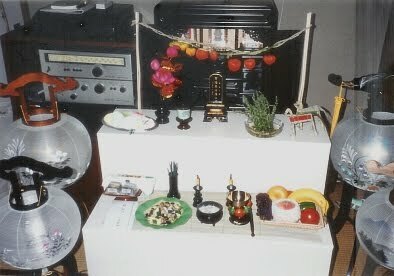 We place the tablets, a cow and horse made of cucumber and eggplant, an incense burner, a rin gong, candle holders, a mixture of rice, diced eggplant and cucumber called Mizunoko(水の子), loosestrife(禊萩, misohagi) and offerings of soumen(素麺,Japanese vermicelli), fruits, dry confectionery in the shape oflotus or chrysanthemum on the mat. I prepared the alter after visiting the family grave. This arrangement is simple and is a little different from the traditional model. Some people prepare more imposing altars. People belonging to some sects don't prepare a special altar for the festival. I put Bon Festival lanterns together every year. All the constituent parts of a lantern fit in this blue box. Most of their parts are made of wood and silk. These are silk lanterns with light bulb sockets. This revolving lantern is made of plastics. I heard some foreign tourists buy a Bon Festival lantern as a souvenir. On the evening of the 13th, we light a bonfire using dried hemp stems called ogara outside our homes to guide our ancestors. It rained last evening, so we waited for the rain to stop and lighted a bonfire. When My mother was a child, she was told not to go to rivers or fields during the Bon Festival because the dead who have nowhere to return hid in the places and dragged people into the afterworld. Many temples hold a service for them during the festival.